We've helped 1000+ companies grow their client base through Facebook Ads. Since 2012, LBD Marketing have approached Facebook Advertising in a simplified, yet effective way for our clients. We've based our reputation on our proven results, and our ability to offer a fixed price service with un-matched features, including free setup including customised landing pages, weekly reporting and a low commitment period of just 3 months. I'd love for you to explore our case studies below to see for yourself. Facebook Advertising is the perfect solution for Local Area Marketing. We can target within a 5km+ radius of your location to ensure you're getting your ideal clientele. 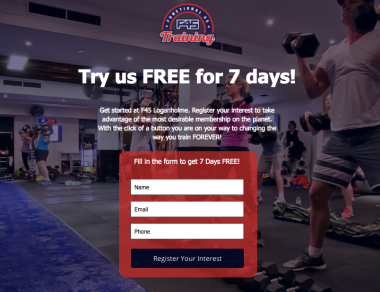 In this case study, we worked with one of the fastest growing Fitness companies called F45 Training to help them generate enquiries for a new franchise. Our favourite method of Facebook Advertising is through content bait. This is where you offer a downloadable piece of value in example for the prospects contact details. In this case study, we worked with Masters of Client Retention, a company that helps businesses focus on the value retaining existing clients rather than always chasing new clients. Webinar's are all the rage and Facebook Advertising is the perfect medium to grab attendees. In this case study, we worked with a company called iTESOL who offer a training course on how to become an Online English Tutor. They used a strategy of a "Webinar Replay" in conjunction with an email follow up series. Facebook Advertising is the perfect medium for consumer services. In this case study, we focus on a hair & beauty salon known as Studio Minx, who are located on the Gold Coast. The clients goal was to offer new clients the chance to choose between 5 current promotions to build a long term relationship. The Burger Institute knew it had the best burgers in Australia, and it was time to tell the public. To get the word out, they started a competition to win a burger for you and a friend every week for 3 months! Competition style campaigns are a great way to quickly grow your brand and database at an affordable cost. The clients goal was to offer new clients the chance to experience their first acupuncture session for just $15. Do you require Search Engine Optimisation (SEO)? - If so CLICK HERE to see our packages.